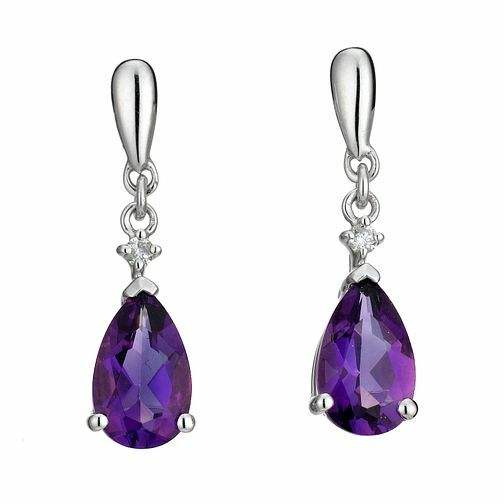 An elegant pair of amethyst and diamond drop earrings set in 9ct white gold. A stunning gift for any occasion. 9ct white gold amethyst & diamond drop earrings is rated 4.3 out of 5 by 7. Rated 3 out of 5 by Anonymous from Too small, but elegant design Too small, but elegant design. Very difficult to put it in as it is tiny, but looks lovely. Rated 4 out of 5 by Anonymous from A lovely option to go with ring and necklace These earrings were a great choice to go with a necklace and ring that I purchased from the same range. earrings are a little small in size but the quality looks good. I think for the price I would have liked to see them a little larger in size. I feel the price did not match the earrings size however, they look great when on.